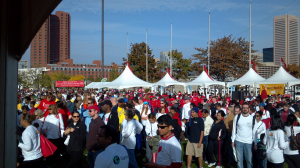 On Saturday October 20th Chesapeake AED Services assisted the American Heart Association at the annual Heart Walk. This year’s event was attended by over 7,000 people and raised $1,379.000.00. Chesapeake AED Services conducted free Hands only CPR Training at the event. Attendees were given a presentation and then performed the CPR compressions on manikins. This process is for people who have not had any training and is not for certification. The American Heart Association says that if you see an adult collapse, you should do 2 things. First, call 911, 2nd push hard and push fast in the center of the chest until help arrives. There is no breathing required for Hands Only CPR. Several students thought that breathing is no longer required for CPR. That’s a common misconception that is quickly pointed out by Mike. “If you need certification you must attend a class where you will be instructed on performing rescue breaths as well as compressions”. You can get certified in CPR through traditional classroom training or you can now do what is called Blended Training…a combination of on line training followed by a hands on skill session and then receive certification in as little as 1 hour. “We get a lot of requests for the on line training which is more convenient for busy schedules”. Chesapeake also had AED’s on display and distributed information about implementing AED programs. One of the Cardiac Arrest Survivors came by the tent and gave his story. He was playing soccer and went into Cardiac Arrest. A teammate was a firefighter who started CPR but the facility did not have an AED. After paramedics arrived it took 5 shocks to resuscitate the victim. The facility has since purchased and implemented an AED program. Many times facilities purchase an AED after there is an emergency which is usually too late. Fortunately this victim survived but it could have been much worse. If CPR and an AED is applied within 3 minutes of collapse the victim has about a 74% survival rate. If no AED is present that survival rate averages between 5-7%. For more information visit our website or call Chesa[peake AED Services. 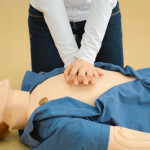 How do I know which CPR class to take?